Crafted with traditional style, the Chelsea Oak Stool Brown Leather makes a classic and refined addition to the bar area. Tailor made at the perfect height for standard kitchen worktops, the Chelsea Oak Stool exudes class wherever it is placed. 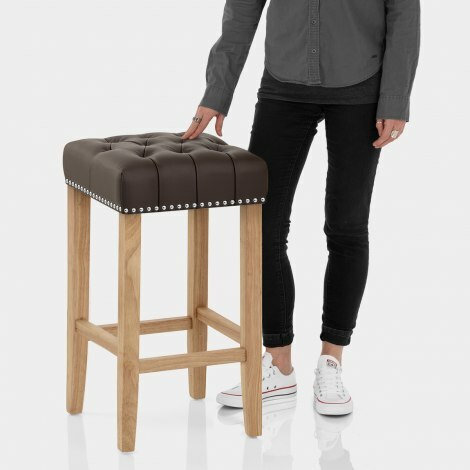 Genuine brown bonded leather gives the padded seat a classic luxurious look, whilst quilted stitching and metal stud edging adds striking detail. A timeless backless piece, the solid wooden frame has a delightful warm oak finish that complements the seat. The four legs, complete with protective floor plugs, keep the stool rigid and stable, with bracing bar footrests between to reinforce the feel of security. Very pleased with the Chelsea Oak Stools. They were easy to build and are smart and sturdy.